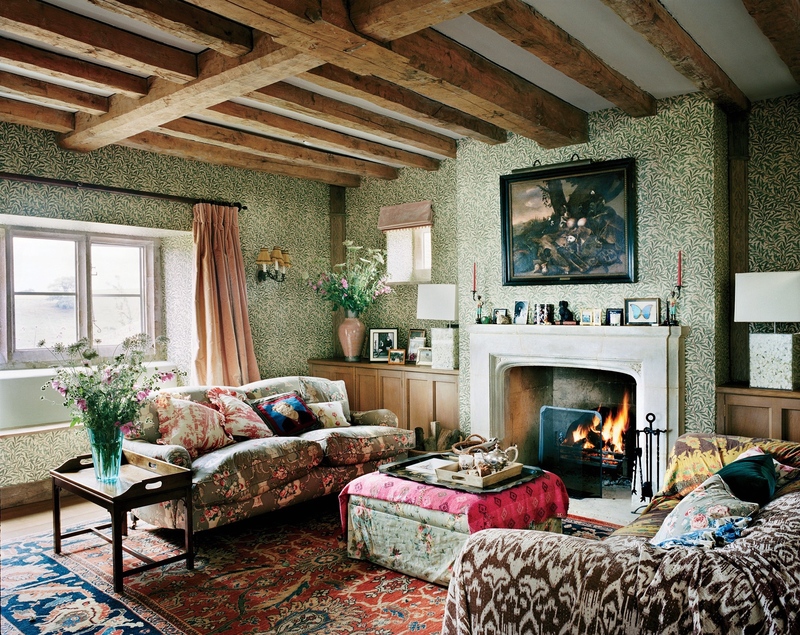 Plum Sykes' home in the Cotswald Hills, originally featured in the October 2016 issue of Vogue and, then, later, in Vogue Living: Country, City, Coast. 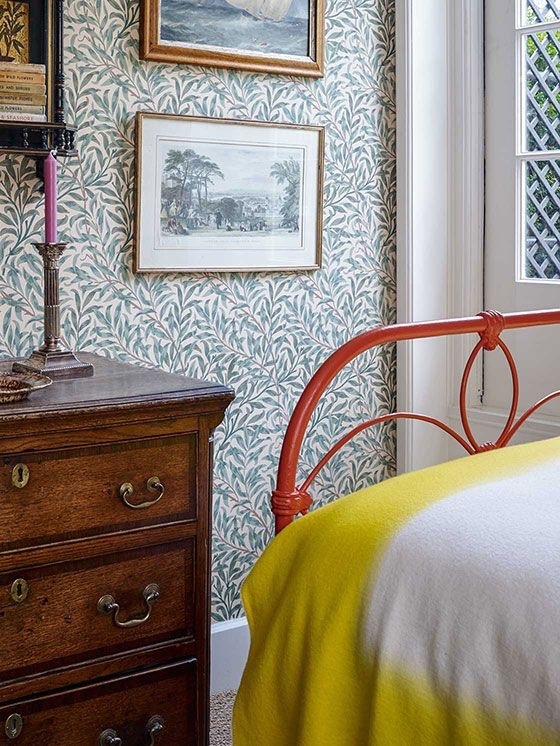 The guest bedroom in the Bloomsbury townhouse of Ben Pentreath (Kate Middleton's designer) and Charlie McCormick (my favorite gardener), originally featured in Ben Pentreath's book English Houses and, most recently, in featured in House & Garden UK. A very chic and decidedly modern use of Willow Boughs by Dutch decorator Emma Von Bromssen. Adam Bray's deft use of Willow Boughs. 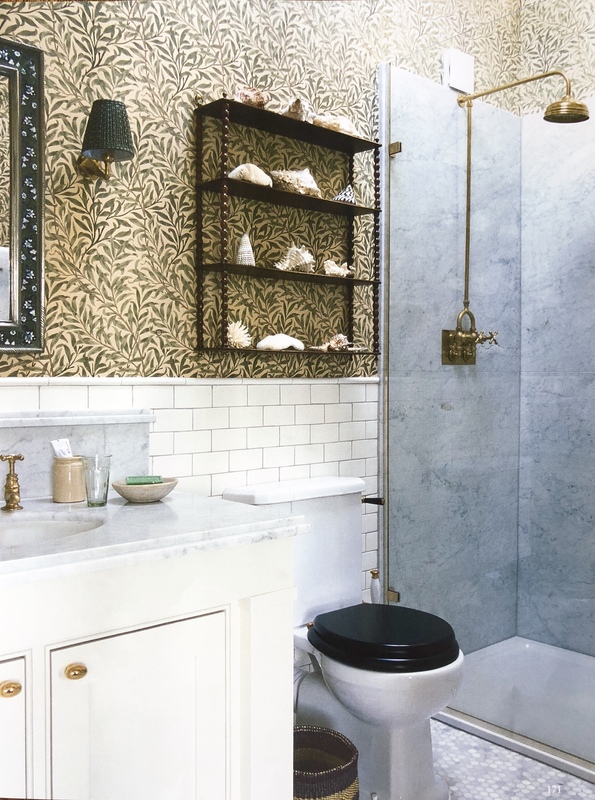 I clearly did not have the vision to see the beauty or genius in the use of Willow Boughs in a bathroom (although this one is much more up to date than the one in which I first encountered the paper). 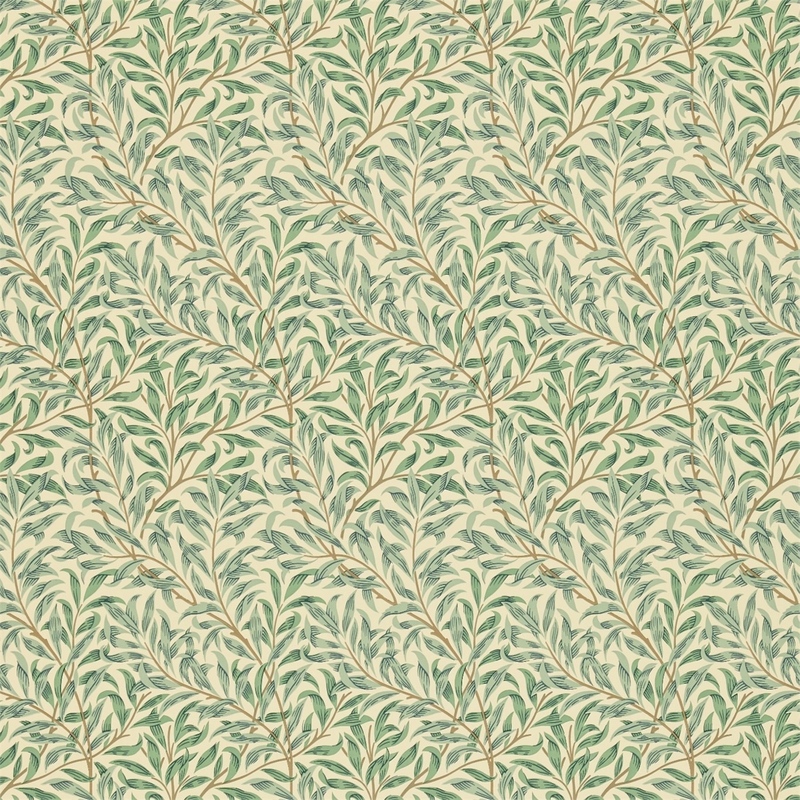 I recently started a new project that has me knee-deep in English Country charm. My idea board has brought me to a wallpaper with which, over the past few years, I have had a growing obsession, although I have to confess that this one did not reach out and grab me. It had to marinate in my brain for a few years before I latched onto it's utter fabulousity. 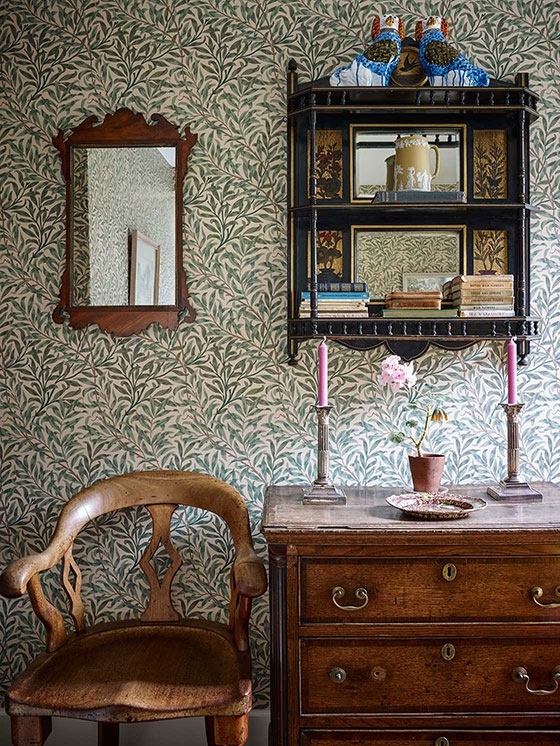 I was first introduced to William Morris's Willow Boughs about five years ago when I found it in a client's bathroom. She had just acquired the house from an fabulously chic elderly woman who had last updated her interiors in 1980. And, the bathroom looked it. Long and narrow with very little light, the Willow Boughs paper just exacerbated the over-pronouncements of the bathroom. So, it really did have to go. The next time I saw it, I did a double take. 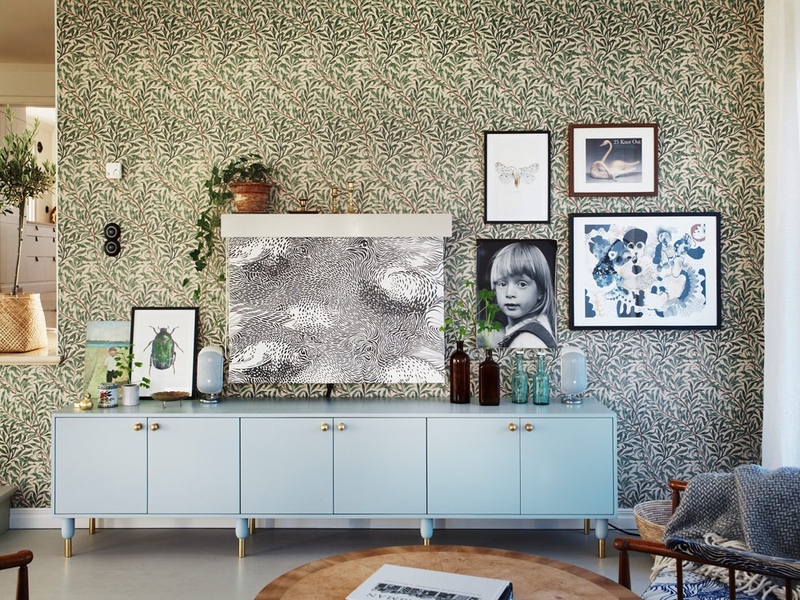 Delighting in the fabulous interiors of Plum Sykes (my OG girl-crush) in the pages of the October 2016 issue of Vogue, I stopped dead when I realized that Plum's living room was wallpapered in the same Willow Boughs we had removed just couple of years before. What???? Only this time, it seemed perfect for the old English country house with the rough-hewn beams, oversized fireplace, mismatched chintz slipcovers and super-chic pale pink velvet drapery. Wow. It was just so English and just so gorgeous!! Not long after, I received my copy of Ben Pentreath's English Houses and boom! 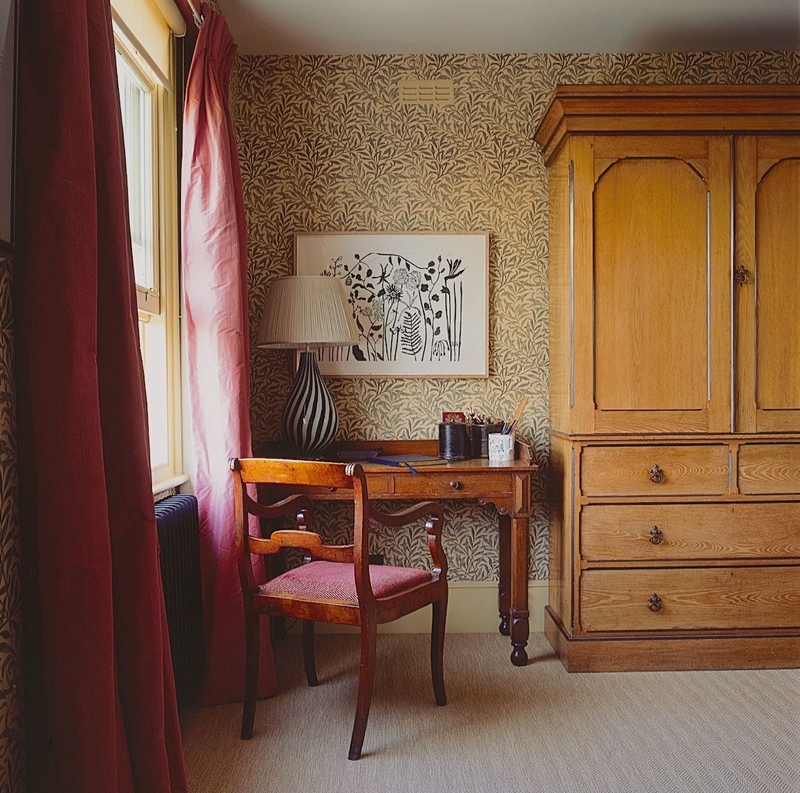 there it was again in the guest bedroom of his (and Charlie McCormick's) Bloomsbury townhouse. (Ben is Kate Middleton's decorator). 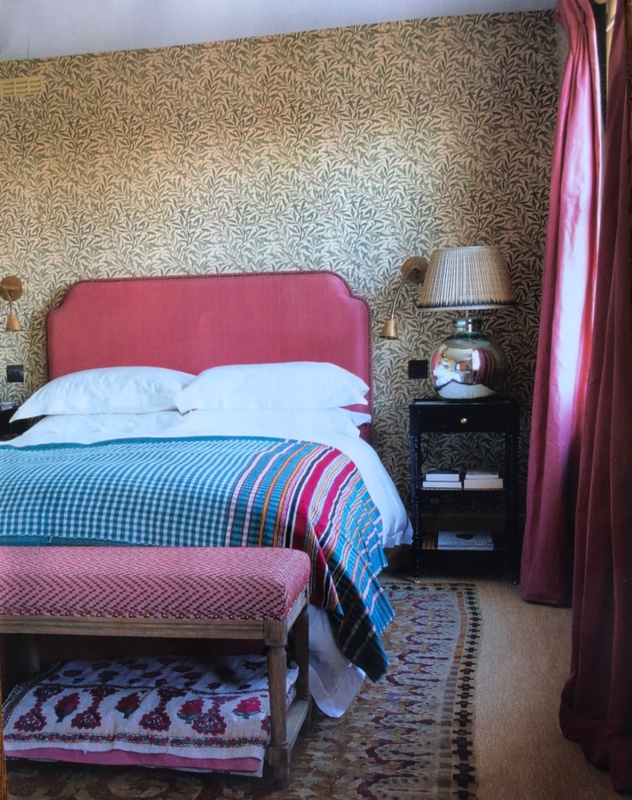 This time it was paired with a bright orange painted metal bed (very much like the bunk beds used by David Netto in my Favorite Fabric: Sevilla post) and some fabulous antiques (including an extraordinary japanned hanging shelf). At this point, I made a note to myself that this Willow Boughs is much chicer than the '80s grandma decor I first took it for. In fact, I was pretty obsessed my this point. But, who would I ever convince to use it? Then, a couple of weeks ago, I received the April 2018 issue of World of Interiors, and there it was again. 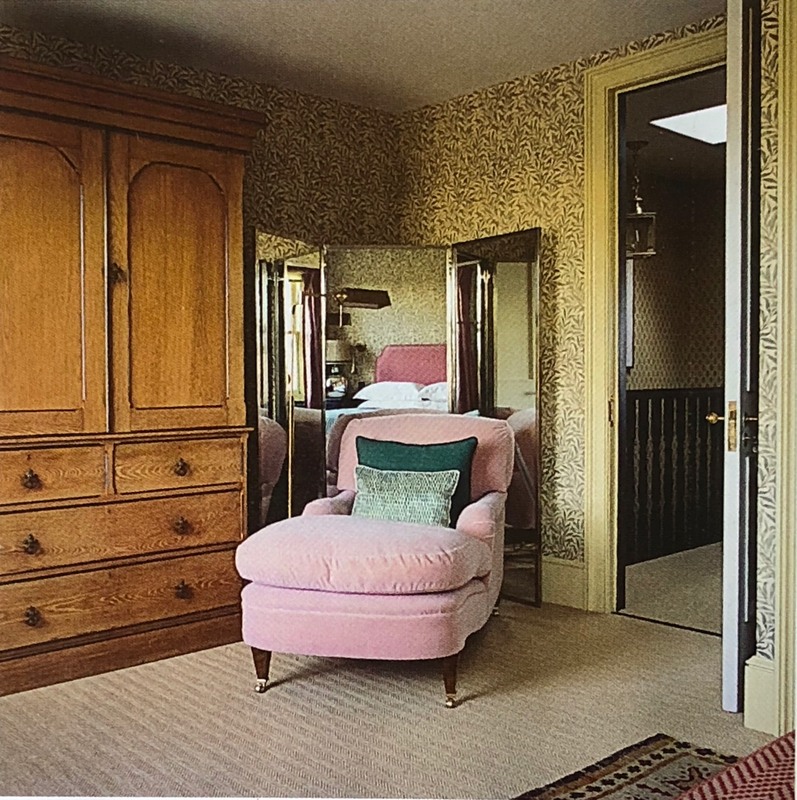 Paired again with pale pink velvet, as well as raspberry pink silk drapery, Adam Bray (always so crazy for his work) used it in both the master bedroom and bathroom (what????) of a Notting Hill villa he recently completed. By now, my obsession is reaching fever pitch. And, so, here it is now, front and center on my idea board. Fingers-crossed client will be as smitten as I am. P.S. Don't forget to check the Shop! New items added daily!